You’ve thought it over, done your research and you’ve decided you want to freelance. Congratulations! Whether you’ve decided to make it your full-time career or you’re working in between jobs, like I am, freelancing can be exciting, liberating and frightening. Here are some tips and things to keep in mind as you venture out on your own. Reach out to your network, your family and friends and let them know about your new venture. Those closest to you are the best ones to sing your praises to potential clients and send new work your way. Freelancing is a bit more relaxed when it comes to structure, but take a page out of the corporate handbook and get everything in writing. Get your rates and all work expectations written out and signed by both yourself and the client. The more detailed your contracts and descriptions, the less uncertainty you’ll have down the road. Just as clients come to you for your professional expertise, you should visit the experts for the business aspects you may not be so well-versed in, like taxes, website design, printing, accounting, contracts or anything else you could use some help in. There are things that need to be done a particular way and need to be done right, so why not do it right the first time? Treat it like it’s a 9-to-5. You could put off showering all day and work from the couch in your pajamas while watching Netflix, but you may not get a lot done – if you can, kudos to you! For the rest of us, though, it’s important to roll out of bed, shower and head to the “office.” Set up a designated work area in your home, head to a library or coffee shop where you can easily work, or opt for renting a desk or office in a community workspace – whatever lets you work best. 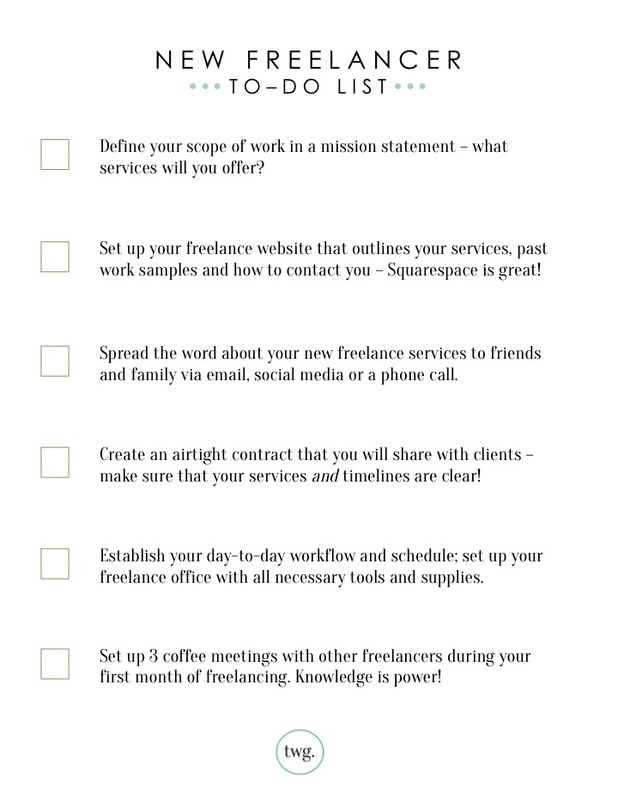 Enjoy this new freelancers to-do list printable on us! Use it to start your new freelance business out on the right foot and to take all of the steps to success. What are your best tips to help new freelancers make the transition? Leave your advice in the comments below or tweet us at @HeyWorkingGirl!